Morning Motivation—Are you thinking of the unexpected? Are you thinking of the unexpected? 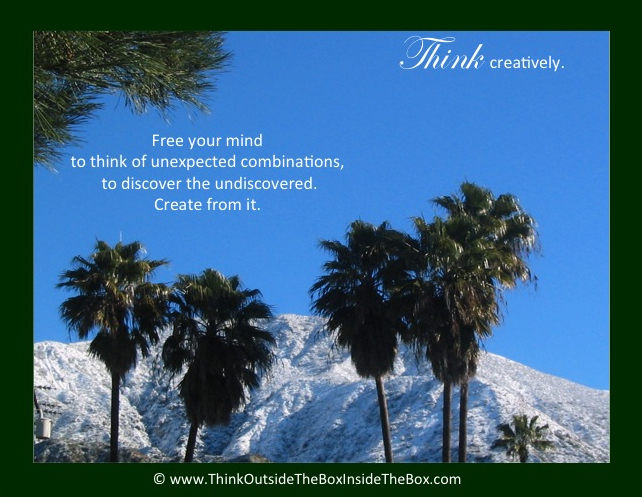 To get the mind thinking creatively try putting completely ridiculous combinations together. Things no one associates with the other. Instead of peanut butter and jelly, what about peanut butter and onions? Instead of liver and onions, what about liver and jelly? Instead of peas and carrots, what about carrots and cotton candy? Instead of palm trees and sand, what about palm trees and snow? Match the square peg and the round hole. Surprise yourself with what you can come up with! See if it helps loosen up your creative wheels and gets them turning. There are no rules. Break through stagnant thinking by shattering what your mind expects. Create from what you discover.